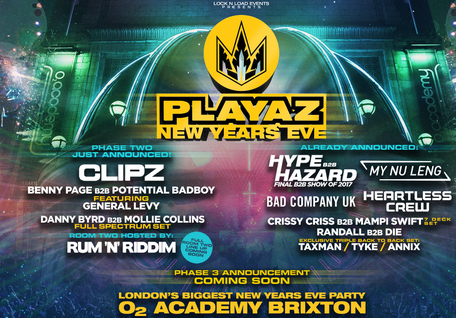 Coming off the back of an appearance at London’s SW4 festival, Playaz returns to the capital at the 02 Academy Brixton this New Year’s Eve for the brand’s biggest ever event. Headlining what may be one of London’s biggest New Year’s Eve shows are Hype & Hazard performing a back to back set. The party will also feature a line-up that includes My Nu Leng, Bad Company UK, Heartless Crew, Benny Page b2b Potential Bad Boy featuring General Levy, Mampi Swift b2b Crissy Criss (7-deck set), DJ Die b2b Randall, Danny Byrd b2b Mollie Collins (Full Spectrum set), and Taxman b2b Tyke b2b Annix. Very special guest will be Clipz. Rum ‘N’ Riddim will host Room 2. In the world of D&B there are apparently few labels that match the events record set by Playaz. The imprint has notched up over 150 shows since their first party at London venue The End, before relocating to Fabric, and since then running shows at Electric Brixton. This summer, Playaz’ stage at the 2017 edition of SW4 apparently became one of the festival’s highlights, leading SW4 promoters Lock N Load to choose Playaz to host London’s biggest NYE 2017 event.